Many people think rabbit rodent.. is this correct? Not too wrong. Rabbit experts also thought so until 1912 when rabbits separated from order Rodensia (rodent) into order Lagomorpha. Main difference between rabbits and rodents is on their incisors in upper jaw. Rabbits have 2 pairs while rodents only have 1 pair of incisors. There’s two families in Lagomorpha. One is pika (family Ochtonidae), other is rabbit and hare (family Leporidae). Pika, family Ochtonidae in Lagomorpha. 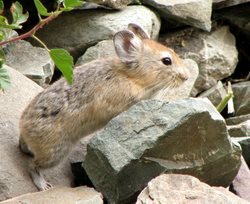 Pika is like rabbit but smaller with ability to whistle in high-pitched, so called “whistling hare”. Sometimes also called “rock rabbit” or “coneys”. Pika’s habitat spread over East Europe to Japan, from Siberia to Himalaya. Also in North America from Alaska to Rocky Mountain.